Many responsible dog owners love to hike outdoors with their faithful companions and seldom is there a problem on the trail. But while our beautiful wilderness may look peaceful enough, the outdoors can become potentially life-threatening for your four-legged friend. From ticks, painful thorns, poisonous snakes and other potentially harmful elements, your dog can get into serious trouble outdoors on the trail, sometimes without you even seeing the dangers. Here are five of the most important things to know to make your dog’s outdoor experience as enjoyable as possible. Save yourself lots of worry, and follow the does and don’ts about hiking with dogs and see your Vet before you begin your adventure to ensure your dog is physically in good health. For more information educate yourself on sites like peteducation.com. Never hike with your dog on a hot day. Heat-related issues are sometimes life-threatening without immediate treatment. Overheated dogs can suffer heat stroke or sudden death from cardiac arrhythmias. Always start by hiking or traveling in the coolest part of the day like the morning hours and bring lots of water to prevent dehydration, and be sure to bring a collapsable drinking container. Dogs sweat from their pads of their feet, not their body like us, so it’s very difficult to see when a dog is overheated. Panting is just one sign that a dog is getting overheated. If you are hiking on asphalt or cement trails, be sure to touch the ground with your palm. If it’s hot to the touch, stop and turn around. Look for areas that are shaded along the trail for periodic rests. While even the most fit dogs can handle the exercise, never take a dog on extremely long hikes. It’s best to keep your hiking to easy trails on smooth surfaces whenever possible. Paw injuries are very common outdoors. Just like you or I, dogs can get blisters on their pads. Hiking booties for dogs are extremely popular and will help prevent blisters and reduce the likelihood of injury due to thorns, sharp stone, and other elements. However, not all booties on the market are made the same, and quality and fitment should be your number one concern. A dog’s paw and pad are the most sensitive area on their body, and whatever you do don’t force it. If a dog rejects the booty, try again and make it fun. Sometimes it takes some practice at home before the dog understands what you are attempting to do. A lanolin-rich pad ointment is a must-have in case you see any pad injury, which can be purchased at any pet store. 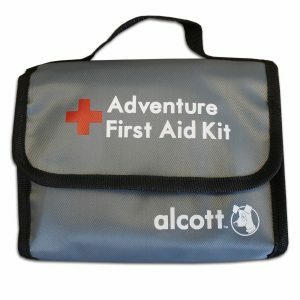 Make yourself a carry-along first aid kit for your dog. It should contain products like bandages, sterile saline, eye wash solution, wound disinfectant, cold packs, towels and the numbers to your Vet and Poison Control Center. There are many sites that offer a complete list of what to bring, but make it light enough to fit into a quality dog backpack without putting stress on the dog. These dog backpacks are great for carrying a small supply of water and food too. Be sure to bring enough food and water along, even on short trips. One of the most important things about hiking with dogs is to keep them under control at all times. Not only can they be spooked by other animals on the trail, a dog might wander off and stumble upon a snake, or worse! Dogs should always heel by your side on a solid leash measuring no more than 6 feet long. A sturdy flat buckle collar is advisable. Always bring along plenty of doggy bags too, and pack out what you pack in! Our National Parks do not allow dogs on the trail, so be sure to check in with the ranger station before starting out. 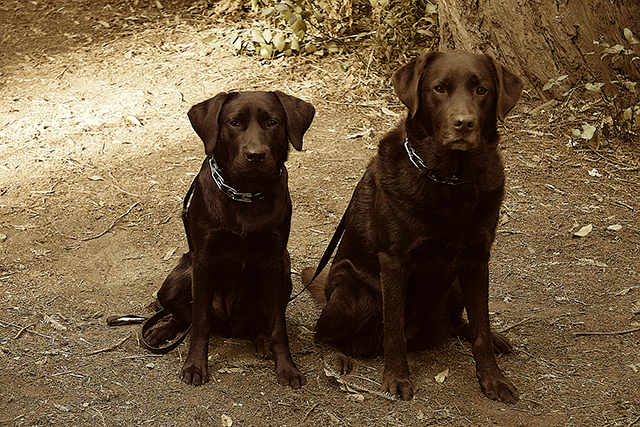 If you encounter another dog or animal on the trail, immediately sit your dog. Let the animal, or other dog, pass by you and keep a good grip on the leash. Once the potential threat is gone, reward your dog and move on. Using good trail etiquette and having a plan are two things that can save your dog from injury or worse. Ticks are a normal part of the wild, they live in areas thick in foliage and they often attach themselves to a dog, who might rub against the brush they are hiding in. Always make a tick remover tool part of your first-aid kit. Ticks can be very painful to dogs and if they go undetected they can cause serious health issues and even lead to paralysis. Two of the diseases people are familiar with are Lyme disease and Rocky Mountain spotted fever. Months before heading on your outdoor adventure with the dog get started on a regular dose of flea and tick medicine, which is sold over the counter at any pet supply shop. While this is typically enough to prevent ticks from attaching to your dog, it doesn’t always work and you will still need to check your dog thoroughly after every hike. Editor’s Note: Larry Saavedra is a journalist and an AKC Field Test Judge. He has covered the outdoor industry for the last 25 years and owns Labrador Retrievers.